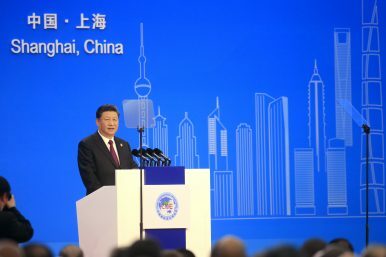 Chinese President Xi Jinping speaks at the opening ceremony for the China International Import Expo in Shanghai (Nov. 5, 2018). Globalization cannot be stopped by anyone, Xi warned as he welcomed other countries to boost exports to China. On November 5, the first China International Import Expo (CIIE) opened in Shanghai. More than a trade fair, the event is designed to bolster China’s image as an open market – particularly in the face of a mounting trade war with the United States. According to Chinese state media, “a total of 172 countries, regions, and international organizations” were represented at the inaugural CIIE; 82 countries had booths set up in the Country Pavilion for Trade and Investment. More than 3,600 companies were in attendance. High-level attendees include the presidents of Cuba, the Czech Republic, the Dominican Republic, Kenya, Lithuania, Panama, El Salvador, and Switzerland as well as the prime ministers of Croatia, Egypt, Hungary, Georgia, Laos, Malta, Pakistan, Russia, and Vietnam. The CIIE was not originally conceived of as a response to the trade war between the United States and China. Those tensions began in earnest this summer, while the expo has been the works for well over a year — it was first announced at the Belt and Road Forum held in Beijing back in May 2017. In fact, the CIIE was originally supposed to help ease trade tensions by promoting China’s openness to foreign companies – and, implicitly, signaling the country’s willingness to rein in ballooning trade deficits with the United States and other partners. “All countries should be committed to opening up and oppose protectionism and unilateralism in a clear-cut stand,” Xi urged. As part of that, he repeated past promises that China will continue to promote a “new round” of opening to the world. Xi was thus quick to point out that the CIIE was the first national-level expo in the world to focus on imports. There were clear echoes here of Xi’s speech at the 2017 Davos meeting, where he tried to position China as the new defender of free trade and globalization. That branding exercise has become both a harder sell and a more crucial one for China to make as the United States and European countries step up their criticisms of Beijing for placing restrictions on foreign firms. The emphasis on the BRI was also clear from the list of attending leaders. Key nodes of the Belt and Road – Southeast Asia, East Africa, Central and Eastern Europe, and of course Pakistan — were represented by heads of state and government from regional countries (Central Asia was notable here for its absence of top-level representation). One of the critiques levied against the BRI – and Chinese trade policy in general – is that it tends to overwhelm developing markets with Chinese goods, damaging local industries and engorging trade deficits. The CIIE was supposed to be an antidote to those charges, by explicitly offering BRI (and other) countries a chance to sell their own goods to China. Interestingly, however, despite the expo being heavily geared toward imports, China also had its own booth — with Chinese exports on display. In a particularly obvious bit of BRI symbolism, the Laotian and Vietnamese prime ministers took a simulated ride on China’s newest high-speed train at the Chinese booth. But the political meaning was most stark in the attendance of the presidents of El Salvador, the Dominican Republic, and Panama. All three Latin American countries cut ties with Taiwan in the past two years in favor of establishing relations with Beijing. Their presence at China’s marquee business event of 2018 was a clear signal to Taipei’s existing diplomatic allies of the economic rewards of joining Team Beijing. The CIIE will run from November 5 to 10, and is expected to be an annual event hereafter.